I work with time. With the time of my own life. And with speech. With what I say about time and its course. And with what arises from the action within the word. And in things. And from this I propose dialogues with the world. I seek other possibilities. I seek to expand my range of action and reaction as a human being. I studied Graphic Design, Plastic Arts, Architecture, Philosophy and City Planning. I have participated in seminars, clinics, residences and academic exchanges within and outside of Argentina. 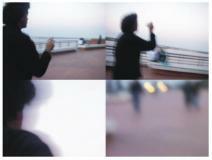 I have published critical texts and worked as a curator in visual arts expositions. I have received national and international prizes and scholarships for production of work, management and research. 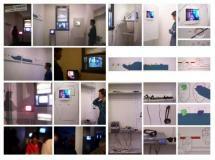 Since the year 2000, I have shown individually and as a part of group exhibitions, group projects and curatorships. I define my work as the work of an artist. PRESENT PRESENT / First phase in curatorial residency (May and June of 2006) - With the participation of Mariana Robles, Laura Del Barco, Silvia Diehl, Isabel Caccia, Soledad Sánchez Goldar and Grupo Faldas (Melina Scumburdis, Florencia Fernández Frank y Violeta Cincioni) – Texts, objects, photographs, installation, specific works, videos, artists books, embroidery, performances, actions, meetings with the artists and round table with the participation of gallery owners, critics and specially invited collectors– Espaciocentro Arte Contemporáneo – Córdoba. 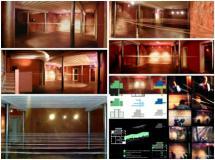 NABSIR / Third phase in residency (November of 2006) - With the special participation of Ana Volonté as invited artist - General view and details - Monochannel video (Fabhio di Camozzi) and printed data specifically installed (Ana Volonté) - Espaciocentro Arte Contemporáneo – Córdoba. NABSIR / Second phase in residency (August of 2006) - With the special participation of Martin Russo as invited artist - General view and details – Multichannel video and distorted audio of live F.M radio stations, listened to with headphones (Fabhio di Camozzi) and paintings, installation and video projection from PC (Martín Russo) - Espaciocentro Arte Contemporáneo – Córdoba. 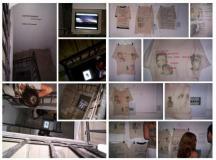 NABSIR / First phase in residency (March of 2006) - With the participation of invited artist Edgar Tula - General view and details – Video instalation in some unused stairs (Fabhio di Camozzi) and images on T-shirts (text, design, prints, costume and montage by Edgar Tula) – Espaciocentro Arte Contemporáneo – Córdoba. 2006 - Work in progress - Video stills and detials of a performance held during a projection in a Black Box, White Cube, in the fair of galleries arteBA 2006 (photographs of the performance: Silvia Diehl) - Buenos Aires. 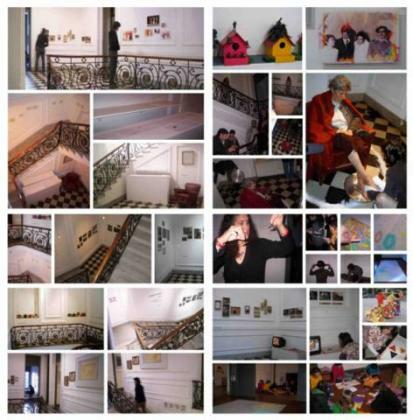 2007 - With the special participation of Andrea Fernández as invited artist - Fragments of the project were completed in residency at El Levante, with the support of the El Levante prize for Artistas del Interior del Pais and from the American Center Foundation (photographs: Andrea Fernández) – Rosario. 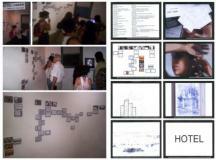 2006 - With the special participation of Isabel Caccia as invited artist- General view and details of performance in residency – En Ciudades Probables, Ciudades Posibles, (In Probable Cities, Possible Cities) organized by the Universidad Nac. del Litoral, with the support of the Museo de Arte Contemporáneo de la ciudad de Santa Fe - Santa Fe. 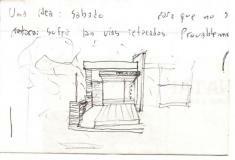 2004 - With the special collaboration of Aníbal Buede - General view and details – Intervention (pencil and charcoal directly on the wall) and unexposed texts; intermittent fast flash and fluorescent lights (design, installation and lighting: Aníbal Buede) - Casa 13 – Córdoba. 2004 - Work with Grup00 – General view and details– Intervention (double wall of elastic bands of expandable rubber, profile of painted iron and hooks of unoxidized steel) in the entrance way of the exhibition B00M of Grup00 shown in el Centro Cultural España Córdoba, Córdoba. NOTE: There was also a series of texts that Fabhio di Camozzi wrote specifically for this occasion that were secretly hidden in the books of the library in the space. 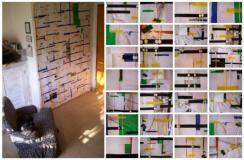 2003 - Work with Grup00 – General view and details– Intervention (self adhesive contact film, colors - oranges, yellows and browns, pinned upon the wall) in the sector of Grup00 of the exhibition Panorama I - Centro de Arte Contemporáneo Chateau Carreras – Córdoba. 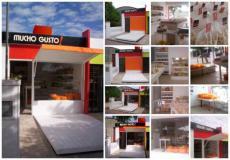 2003 - Work with Grup00 – General view and details - Intervention with self adhesive film, dark and light green color (Fabhio di Camozzi) on melanin panel - Stand of Grup00 - Feria de galerías Arte Córdoba - Cabildo Histórico de la Ciudad – Córdoba. 2002 - Curated by Grup00 - General view and details – Linear Module (self-adhesive contact film on paper) and objects (cloth, rubber foam, wires, wool, pvc and hooks for lingerie) - Juana de Arco – Buenos Aires. 2001 - Curated by Grup00 - General view and details – Photographs (polaroid), objects (plush, towel, insulating tape, glass, plastic models and lining, embroidery, leather shoe), text, installation and several hidden interventions - Alianza Francesa – Córdoba. 1. I feel that the work that best represents me at this time is Hotel. Which I am working on now in another process, it is this project that I believe has, currently, all of the characteristics of work that I can refer to as representative of my interests and my drive in art. In HOTEL the idea was to merge a direct relation throughout my work, the procedure and the research, all within an ambiance "of artist". In the first phase, the plan worked, from January to December of 2006, while in a residency that I designed to keep myself lodged twelve months in a Contemporary art gallery in Cordoba. I invited Lucas Di Pascuale to be my outside coordinator for all of HOTEL. In that environment I developed three projects: a work in videoperformance format (with the internal coordination of Soledad Sánchez Goldar), a curatorship (advising in script and montage by Aníbal Buede) and field research about the art in Córdoba (with general coordination by Verónica Molas, Belkys Scolamieri y Gustavo Blázquez). 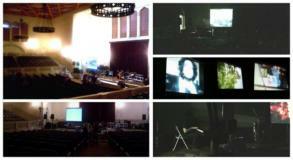 In each one of these areas there were partial shows, collective expositions, chats, roundtables, conferences, presentations, etc. In 2007 I received a scholarship from the Fondo Nacional de las Artes to carry out postproduction work on all the information, the data and the pieces that were obtained as a result of that first phase. I am still working on it. I suggest being dedicated to the living of life. 3. I place myself within any tradition where the artists are real professionals who compromise with their work, and also with their ideas and their thoughts, contemporaries and of every epoch, and those who intellectualize like iconoclasts (..) I have many contemporary influences. I have them in many different arenas, I read them, I follow them, we discuss, we look at oursleves, they tell me, I listen to them, I respond to them... I have a tight personal relationship with all of them. They are my friends. Naming them would be a serious indiscretion on my part. The artists I'm interested in, fundamentally, of the previous generations are, always, among many others, Marcel Duchamp and Joseph Beuys. IMPORTANT: Remo Bianchedi is the contemporary Argentine artist -of a prior generation- that I choose today as a close active influence and as a teacher. I speak with him a lot about art and it is with him that I share my passion for books, and the ramifications metaphors have on history, among other things. It is he who thinks about my work, who lends me the texts that I need to keep close to me, and with whom I share uncertainties, laughter, emotions, art, everything. With Remo the influence is an environment of respect, and a recurrent way to constructive questioning "the hell in which the world has been transformed today" With Remo I also learned that what is important is not to be a teacher, but to learn to be a good disciple... The artists that interest me from the later generations are many, very young, those whom have recently begun to present their lives in art, as is part of the duty of the artist at present, also. They are people that do not necessarily define themselves immediately, instead they work secretly experimenting with their music, sculpture, visual arts, in the theater, design, philosophy, utilizing sound, in photography and documentation, in the movies and video, in performance, graphics and clothing, the internet, criticism, and management, to generate landscapes and architectures that refer to Contemporary art as an intervention which is always specific to an environment, where they are considered almost a secret, where they are able to think without seeking to impose anything on anybody but, on the contrary, they try to implement an opening of options where they can live in peace with what they feel is their faith in art. It is they, also today, who have me at their feet! To name them (as if to invite them to Bola de Nieve in a list that would limit by enunciation) would be inconvenient for me. I ask them to excuse me for the discourtesy in this case, then. I have no desire to make this cut by election, works, exhibitions. It is not like I could, in a word, possibly understand the significance of the last 10 or 15 years of work in Argentine art. The groupings or tendencies is not something that particularly interests me in the Argentinian art of the last ten or fifteen years, neither does the art of any other part of the world or of any epoch, still less if I share common elements with any of them.